Toronto based nTTx (electro-industrial/EBM) returns with a follow up to his well received debut EP 'Objective'. 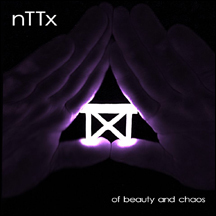 'Of Beauty and Chaos' features 4 original tracks along with a remix of the hit 'Falls Beautiful' remixed by the legendary Rotersand, as well as a cover of the classic '80s hit 'Eye of The Tiger'. The EP is a digital only release, through WTII records. Available on Bandcamp, iTunes, Spotify, and all the usual places. A video for the new single 'MoveDark' will be released shortly.